Use to Sharpen or as a File. Buy Both Grades and Save. The Triangle Arkansas File is more than just a great versatile sharpener. It is often used in industry or by gunsmiths to carefully remove small amounts of metal where metal files would be too aggressive. The triangle shape allows you to get into tight areas that round or squares shapes just can't get to. When it comes to sharpening, the triangle shape has many uses. Some serrated knives have fine fine serrations. In some cases these serrations are so fine that standard rod or cone shaped sharpeners just can't get inside the gullets. With the triangle, you can reach gullets of even micro serrated blades. We've found this stone to be very effective at sharpening the inside of a V-Tools or other similar carving tools. 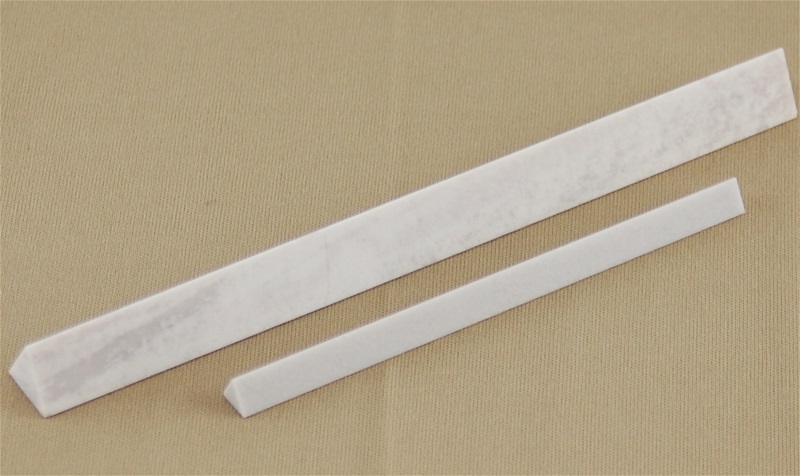 The Triangle Arkansas file is available in a smaller 4" length with 1/4" sides and the larger 6" length with 1/2" sides. Available in Hard Select Arkansas. This grade of stone is fine dense stone. Proudly made in the USA. Made of natural stones quarried in Arkansas. A. Arkansas Stones are graded not by grit numbers like other types of stone, but by their density and hardness. The less dense, or softer the stone, the coarser it is. The more dense, or harder the stone, the finer it is. The Hard Arkansas is in the middle of the Arkansas stones overall, and is considered a medium fine grit. The Hard Translucent Arkansas stones are the finest of the Arkansas Stones and are considered fine polishing grit. See our article Arkansas Stone FAQ's for more information. A. The Arkansas Stones are finer than the Silicon Carbide (Norton Crystolon) or Aluminum Oxide (Norton India) oil stones. 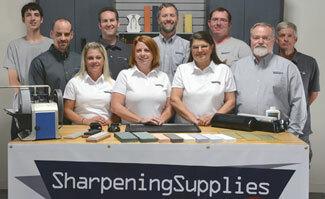 See our article Difference in Sharpening Stone Materials for more information. A. The decision of what stone to finish with is a personal one depending on what kind of edge you desire. A Hard Arkansas will leave a refined edge that is highly polished. A Hard Translucent Arkansas will leave a very refined edge that is approaching mirror fine.